Stephen Hawking charmed a group of Chinese students on Wednesday, telling them he liked Chinese culture and women while warning that global warming might turn the Earth into a fiery planet. Before an audience of 500 at a seminar in Beijing, the wheelchair-bound celebrity cosmologist said, "I like Chinese culture, Chinese food and above all Chinese women. They are beautiful." The audience of mostly university students and professors and a smattering of journalists applauded. Asked about the environment, Hawking, who suffers from a degenerative disease and speaks through a computerized voice synthesizer, said he was "very worried about global warming." He said he was afraid that Earth "might end up like Venus, at 250 degrees centigrade and raining sulfuric acid." 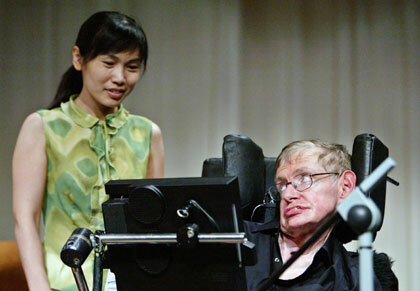 An occasional visitor to China, Hawking was in Beijing to attend a conference on string theory, an area of physics that attempts to explain and model the universe. Hawking has near-superstar status in China, and the Chinese government preaches that scientific prowess is crucial to the country's future power. "In the world there's only one like him. I very much respect his personality and strong spirit," said Liu Fei, 24-year-old doctoral candidate at the Chinese Academy of Sciences' Institute of Physics in Beijing.